The ninth of the ten qualifiers in the FEI World Cup™ Dressage Western European leg drew to a close with the Grand Prix Free at Neumunster today. In first place was Isabell Werth and Weihegold, followed by Helen Langehanenberg in second and Judy Reynolds in third. Werth and Weihegold dominated the rankings as the pair look to retain their world title for the third year running in Gothenburg this April. The small arena was packed to the rafters and the atmosphere seemed to put some of the horses on edge – showing up particularly in the halt and the piaffe. The unstoppable duo sat six per cent ahead of Langehanenberg in second place. 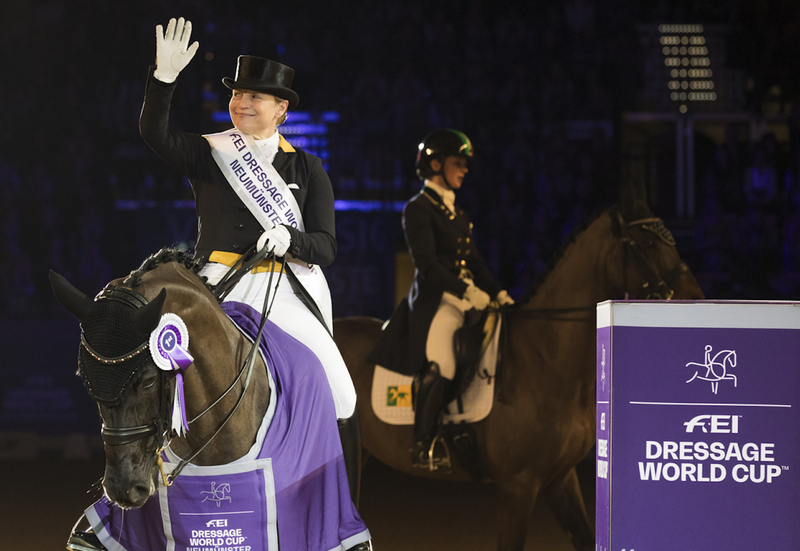 The talk of the town, however, was Irish rider Judy Reynolds and her gelding Vancouver K, who finished third – this marked the first time that an Irish rider had ever finished on the podium in a World Cup Dressage event in Europe. South Africa’s Tanya Seymour had a good performance with 72 per cent against strong competition. Dorothee Schneider, Adelinde Cornellissen, and Reynolds still to go, all of whom could clinch the top spot on the right day. However, after Cornellissen’s test aboard her incredibly expressive stallion Aqiedo, it was still Keller in the lead. Schneider - competing on her fiftieth birthday - on Sammy Davis Jnr, had a few minor mistakes in her canter pirouettes but still went into the lead on 79.5%. She was followed into the arena by Werth on her superstar mare Weihegold. True to form, the pair pulled off a rhythmical and fluent test and propelled themselves into the lead convincingly with 86.8%. Werndl and Daily Mirror had the unenviable task of following Werth and despite some good moments, had some problems in his piaffe, pirouettes, and final halt. It didn’t prevent him from slotting into second place on 80.540 with two riders to go and a possible podium. Reynolds was next to go, with the intention of repeating her feat from the previous day; if her famously hot Vancouver K was able to cope with the pressure and atmosphere. There were some signs of tension, particularly in the in the collected walk and collected trot but the overall test was fluent and well-executed, gaining Reynolds an 82.7% for her efforts. Langehanenberg and Damsey finished off the day with a test that scored a 10 for difficulty – again, there were some difficulties in the piaffe but lovely tempi changes and some exceptional transitions as well as enough canter pirouettes to sink a ship! It was a close call but Langehanenberg came out victorious with 83.8%, keeping the podium the same as the previous day. With only one more leg to go before the FEI Dressage World Cup™ Finals, there’s everything to play for. Keep a close eye on all the action on FEI TV.